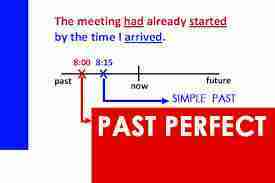 1) THE PRETERITE: is used to express the completed past ( the action is over), and is also the tense of narration. You just have to add - ed to the verb or to learn irregular verbs (!!!) in order to master it totally. That's easy, isn't it! ex : She closed the door, sat down, picked up the phone and dialed. A) How to build it? Interrogative Form: has/have + subject + past participle + ? B) How to use it? - It expresses the assessment of an action. The action is important, not the moment when it happened. ex : 'Have you read Oliver Twist? 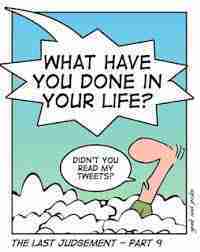 Of course, I have! - It's often used with: already, ever/ never, just. ex : I have never met such an aggressive person!. - This tense is often used with FOR ( duration), or SINCE (starting point) in order to show that the action is still in progress in the present and has a duration, then the -ing form of the present perfect is used : subject + HAS/HAVE been + V + ing. ex : She's been learning Spanish for 6 years. She must be pretty good! A) How to make it? In the same way as the present perfect, in the three forms, except that the auxiliary is HAD all along. 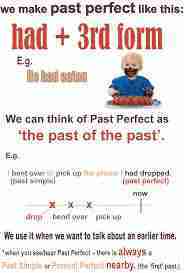 = subject + HAD + past participle. - It refers to an action which happened before a reference in the completed past. ex : When she came back from school, she had already learnt her lessons. ex : The gate had been opened when he arrived home with his new car. ex : The new mother stopped singing because her baby had fallen asleep. - The past perfect can also be in the -ing form in order to insist on the duration of the action. ex : He had been working there for 3 years when he decided to resign. There you are! Be careful, and your results should be excellent ! When Zerrin saw the terrible pictures on TV, it remindedhad being remindinghas reminded herI don't know her of the time when she was a student in Chicago. About ten years before, there had beenwashas beenhad beingI don't know a devastating earthquake in Turkey, her mother country, and the Turkish students had been raisedhave been raisinghave raisedhad raisedI don't know money, and organized events on the campus to send help where it has been neededit had needit was neededit was needingI don't know . Concerning this new catastrophe, there, horror was patent and rescue had started hardlyhas hardly startwas hardly startedhad hardly startedI don't know when she receivedhas receivedhad receivingwas receivingI don't know the text from the NGO she was a member of! After a few minutes, trained as she was, she has decidedhad decidedhad been decidinghad decidingI don't know she'd answer the call and leave for that distant country to help and relieve the wounded. She has thoughthad been thinkinghas been thinkingwas being thinkingI don't know of really committing to a cause for months now and thought it was time she madehas madehas been makinghas takenI don't know the decision. She said to herself : ' I had been doingI had doneI've doneI didI don't know too little, so far . (= up to now) We had been sentwere sendinghave senthave being sentI don't know money, we have givenhad been givenhad givinghave been givenI don't know food and clothes, but we hadn't givinghaven't givenhaven't been gavehaven't giveI don't know our strength and energy yet... That wasn't enough, that was nothing !